Have you always fantasized about sailing through the Greek islands, but assumed you could never afford it? Think again. With a bit of savvy shopping, you can get a yacht charter for less than what you’d pay for a hotel in the same destination. Here are 8 strategies to save money on a yacht charter and get that champagne vacation on a beer budget. Note: this post contains some affiliate links. If you make a purchase through these links we will earn a small commission. Our opinions are 100% our own. Boatsetter is essentially Airbnb for boats. This peer to beer boat rental platform allows you to rent direct from the boat owner. 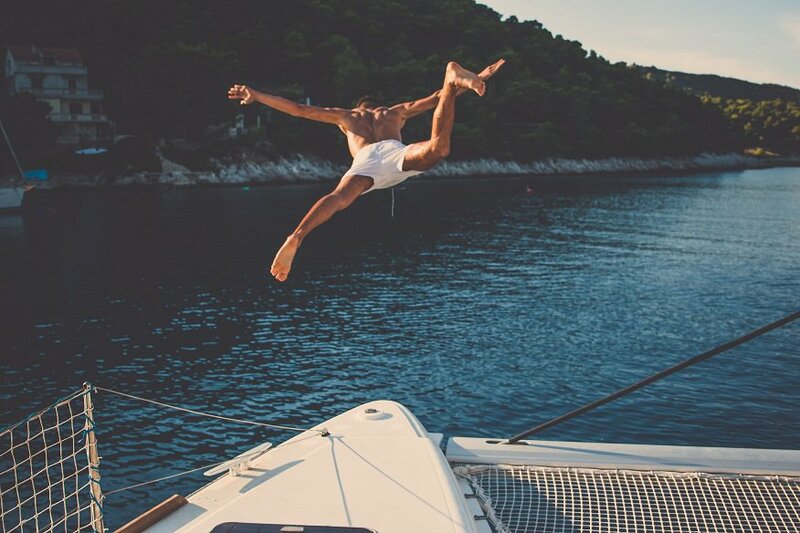 Because most boat owners are just trying to recoup the cost of owning their boat, their rental rates tend to be a lot less than traditional yacht charters. You may have heard of the great deals you can get on cruise ship relocations, and it turns out the same is true for yacht charters. Charter companies often move their fleet throughout the year, delivering boats in and out of winter storage, or sometimes even moving between cruising grounds. Charter companies will sometimes offer heavily discounted prices (up to 60%) for these delivery trips, in order to recoup the cost of relocating the boat. 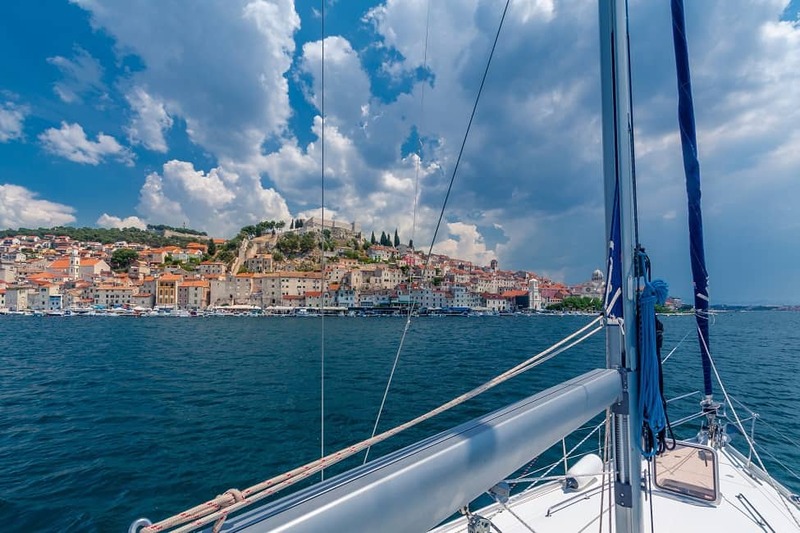 While peak season sailing will afford you optimal weather, you can save money on a yacht charter (up to 50%) by booking in the shoulder or off-season (and still get your dose of vitamin D!). In the Med peak season is summer, with the coldest months being December through February. Your best bet for a deal is booking in the spring or fall, keeping in mind that sea temperatures will be warmer in the fall if you plan on doing a lot of swimming. In the Caribbean, you can enjoy beautiful sailing conditions year-round, though you’ll want to be aware of hurricane season which runs from June until November, with hurricanes most likely to occur between mid-August and mid-September. The high season is winter, driven by snowbirds looking to escape the North American cold. In researching your off-season options, be sure to check the monthly average temperature, precipitation, wind speeds and prevailing wind direction in your destination before booking. An upwind bash in the rain is probably not going to make for a fun vacation. Perhaps one of the easiest ways to cut down on cost, is to share a yacht charter with friends or family. If you don’t have any friends who sail, some charter companies organize share-a-yachts where they will place you on a boat with a couple or singles. What better way to make some sailing friends! This is a great option for solo travelers or those with little or no sailing experience. If you are planning on taking sailing lessons and going on vacation this year, you can combine the two and save. Many charter companies offer sailing courses, and in some cases RYA certification, as part of their yacht charter packages. If you don’t want to commit to a course, but do want to brush up on your skills, many charter companies will provide a skipper who can offer you pointers for as little as $100 a day. Early-booking discounts. Charter companies like to see their boats booked well in advance of the season and offer discounted pricing on bookings made before a certain date. Last-minute discounts. If you’re not too particular about destination, then booking last minute is a great way to get a deal. Charter companies will offer promotional rates when they’ve had cancellations or have surplus inventory at a given time of year. Long-term discounts. The longer you book your charter for, the more you will save. As a general rule of thumb, charter companies will discount by 5% for two weeks and 10% for three weeks. Discounts for bookings 3 weeks + can be negotiated. Loyalty discounts. If you’ve sailed with a charter company before, and they have boats in the destination you’re interested in, reach out to see what loyalty discounts they may offer returning customers. High-season discounts. Set on sailing during the peak season? If a charter company finds itself with boats sitting in the marina, they may offer an in-season discount. When in doubt, inquire about available discounts. They’re not always well publicized and it doesn’t hurt to ask. Generally speaking, smaller boats will cost less than big boats (e.g. a 34 ft boat will cost less than a 46 ft boat) and catamarans will cost more than an equivalent length monohull (though you do get more volume). To give you an idea, here are some prices for a one-week yacht charter in May: $2,300 for a 33ft, 2 cabin monohull; $3,500 for a 41ft, 3 cabin monohull; and $5,500 for a 4 cabin 43ft catamaran. Carefully consider what you need to be comfortable on holiday (is that second head really worth it?). It’s also true that newer boats may cost slightly more than older boats, except in some cases where a charter company many be locked into contracts on older boats (in these cases the newer boats may be less expensive). Perhaps one of the best kept secrets to finding a cheap yacht charter, is searching for “owner’s time”. In many cases charter companies don’t actually own the yachts that they’re chartering out. Individuals buy boats and then put them with a charter company. The charter company rents the boat out and the owner gets paid-out a share of the rental proceeds. Each year the owner reserves 8-12 weeks of time for themselves, and charters the boat out for the remainder of the year. Often, an owner is unable to use up their reserved owner’s time, so they will rent out their boat, usually at a 20-50% discount. Though you can save money on a yacht charter by buying owners time, you’ll also need to take additional precautions. As you’ll be dealing with the owner directly, you’ll want to ensure that they’re a reputable person. This means, among other things, checking references, keeping track of correspondence/payments, and checking with the charter company that this person does indeed own the boat that they claim to. Another downside is that you aren’t guaranteed to get the customer service or professionalism that you might expect with a charter company. For example, owners might be slower to respond to email or mix-up bookings. Owners will advertise their “owner-time” on sites like SailOnline, through classifieds on sailing forums, and on personal websites. As you’re doing your shopping and budgeting, don’t forget to compare what extras are included in the yacht charter. Things like insurance, dinghies, outboards, toys (e.g. snorkeling gear), cleaning fees, fuel, water, ice, phone, internet, transport to/from boat, and hand-held navigation can add up and make what appeared to be a cheap yacht charter, much more expensive. Seeing the world by sailboat is one of the most rewarding and unique travel experiences (and with a bit of research, can be affordable too!). Do you have any tips for saving money on a yacht charter? Let us know in the comments below. A yacht charter doesn't have to be super expensive. Use these 8 savvy strategies when booking your next charter to get the best possible deal. Excellent advice on saving money when chartering. Here’s a link to “Sailvation: Sailboat Charter Briefing” video that walks you through a typical charter boat hand-over. With the information it provides, you’ll be better equipped to understand the hand-over process, ask more detailed questions, and make your next charter cruise more enjoyable and trouble-free. “Sailvation” was created by a team of dedicated sailors with years of experience, not only in cruising but also in chartering and managing boats from popular base stations. They know what sailing is about, what life aboard entails, and what you will experience while chartering. These are the people that you meet on the first day at your charter briefing. Thanks for the tip Tory!